The former High Commissioner of Uganda to Malaysia, H.E. Stephen Mubiru flanked by Datuk Chris Tan; Director Performance Management and Delivery Unit (PAMANDU) Malaysia during a site visit to Cyber World Corporation Sdn.Bhd in Selangor State on 25th July 2016. 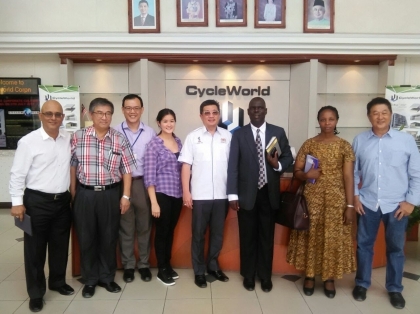 In attendance were Ms. Ldyia Kambazi; Third Secretary to Uganda High Commission Kuala Lumpur and Cyber Cycle staff.